Ethics and Economics Education of New England invites you to participate in a robust exchange of views on the question, “Is the welfare state good or bad for freedom?” Featuring nationally syndicated columnist Veronique de Rugy and Vox and Economist writer Will Wilkinson and moderated by Dartmouth professor and E3NE president Jason Sorens, the panel will consider the controversial “liberal-tarian” claim that a big welfare state promotes free markets. The event begins at 4 PM in the newly renovated Pemigewasset Room at the Radisson Downtown Manchester in Manchester, New Hampshire. Join us at 3:30 for complimentary hors d’oeuvres and libations. Tickets are free but advance registration is requested. This event is cosponsored by New Hampshire Liberty Forum. Veronique de Rugy is a Senior Research Fellow at the Mercatus Center at George Mason University and a nationally syndicated columnist. Her primary research interests include the US economy, the federal budget, homeland security, taxation, tax competition, and financial privacy. Her popular weekly charts, published by the Mercatus Center, address economic issues ranging from lessons on creating sustainable economic growth to the implications of government tax and fiscal policies. She has testified numerous times in front of Congress on the effects of fiscal stimulus, debt and deficits, and regulation on the economy. De Rugy is the author of a weekly opinion column for the Creators Syndicate, writes regular columns for Reason magazine, and she blogs about economics at National Review Online’s the Corner. Her charts, articles, and commentary have been featured in a wide range of media outlets, including the Reality Check segment on Bloomberg Television’s Street Smart, the New York Times’ Room for Debate, the Washington Post, the Wall Street Journal, CNN International, Stossel, 20/20, C-SPAN’s Washington Journal, and Fox News. In 2015, she was named in Politico Magazine’s Guide to the Top 50 thinkers, doers and visionaries transforming American Politics. Previously, de Rugy has been a resident fellow at the American Enterprise Institute, a policy analyst at the Cato Institute, and a research fellow at the Atlas Economic Research Foundation. Before moving to the United States, she oversaw academic programs in France for the Institute for Humane Studies Europe. She received her MA in economics from the Paris Dauphine University and her PhD in economics from the Pantheon-Sorbonne University. Will Wilkinson is vice president for policy at the Niskanen Center, overseeing the Center’s research and publications. 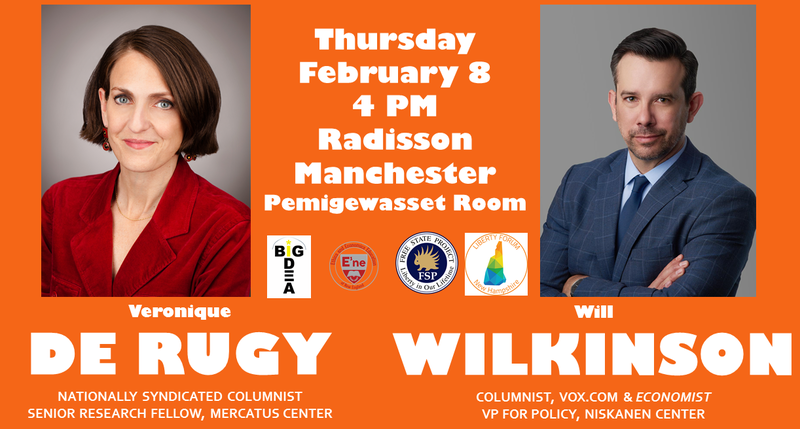 Before coming to the Niskanen Center, Mr. Wilkinson was U.S. politics correspondent for The Economist, and is currently a columnist for Vox‘s The Big Idea section. His policy work centers on domestic social and economic policy, with a particular focus on economic growth, social insurance, criminal justice reform, and issues around the measurement of freedom, equality, and happiness. Previously, he was a research fellow at the Cato Institute, where he wrote on an array of topics including Social Security reform, the policy implications of happiness research, and the political economy of inequality. He was a founding editor of Cato Unbound and has been a program director at the Mercatus Center and the Institute for Humane Studies. In addition to The Economist, Mr. Wilkinson’s commentary has appeared in The Washington Post, The New York Times, The Atlantic, Politico, Forbes, Boston Review, Bloomberg View, and other publications. He has been a columnist for The Week and a regular commentator on American Public Media’s radio program Marketplace. Jason Sorens is Lecturer in the Department of Government and Program Director of the Political Economy Project at Dartmouth College. He received his Ph.D. in political science from Yale University in 2003 and a B.A. in economics and philosophy (with honors) from Washington and Lee University in 1998. He has researched and written more than 15 peer-reviewed journal articles, a book for McGill-Queens University Press titled Secessionism, and a biennial report for the Cato Institute, Freedom in the 50 States. His research focuses on fiscal federalism, U.S. state politics, and movements for regional autonomy and independence around the world. He received his department’s award for outstanding teaching, voted on by undergraduate students in the political science honor society, twice while at the University at Buffalo. He lives in Lyme, New Hampshire.